Overclocking expert De8auer has put together another one of his fascinating overclocking feature videos. This time around, it isn't a new CPU that was put under the cosh but one of Nvidia's new Turing GPUs, more specifically the GeForce RTX 2080. In a departure from the norm, Der8auer also opts to use dry ice (CO2 - boiling point 194.65K or -78°C) as the main coolant, rather than the more commonplace liquid nitrogen (LN2 - boiling point 77K or -196°C). As dry ice is in pellet form it works best in a liquid with a very low freezing point - acting like ice in a drink. Der8auer chose to use 3M Novec rather than an alcohol or solvent like acetone to avoid an unpleasant working environment. With the dry ice in Novec the temperature probe read -72°C. 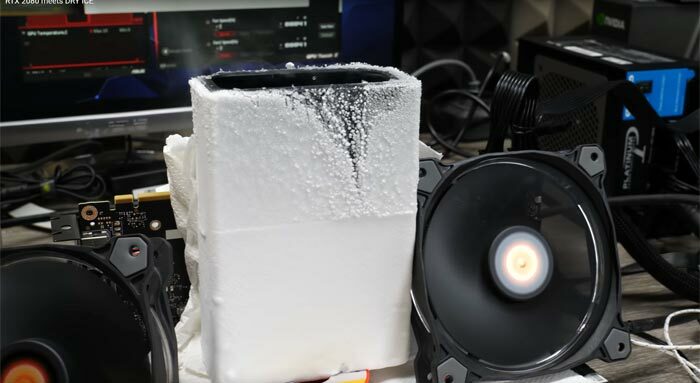 Before diving into the dry ice cooling, Der8auer tested a liquid loop cooler on the RTX 2080. Interestingly he observed that the max stable GPU frequency was not better than with air cooling, at 2,100MHz, however the GPU current draw was reduced. Getting onto the results, throughout his tweaks and modifications Der8auer kept a record of the RTX 2080 performance in the SuperPosition benchmark with the average fps (light blue) and the power consumption (dark blue). Using the dry ice plus 1.20V on the GPU his best result was a 20.9 per cent gain on stock performance but the GPU ate up nearly 50 per cent more power. In this instance the GPU was running at 2,340MHz, and the memory at an effective 16,000MHz. Der8auer concluded that "at stock the cards are running pretty much at the perfect (optimal) efficiency". He went on to postulate that the RTX 2080 Ti would react pretty much the same in temperature and voltage behaviour and thus results scaling. Lastly, Der8auer reminded viewers that using a water block on the new RTX 2080 (Ti) "will not help you that much". 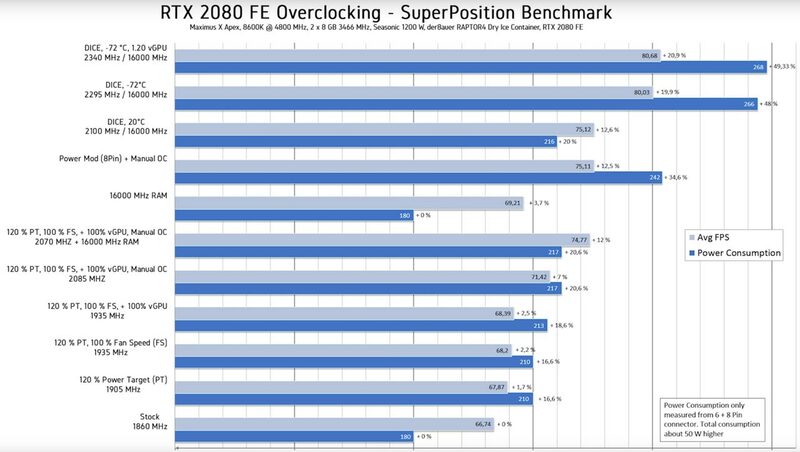 Last week HEXUS reported upon KingPin overclocking an Nvidia GeForce RTX 2080 Ti to 2.4GHz on LN2 and scalping lots of 3DMark benchmark first place records. His LN2 and voltage modding only achieved 2,145MHz GPU clocks. I remember before the launch a lot of people (to be fair, the usual Nvidia fanboys on various sites) were claiming that 2.5GHz on air would be simple with this range. Turns out that 2100MHz is the practical limit. Still, it's still a beast. Undervolting mods might be more interesting. Am I the only one that water cools CPU/GPUs and never overclocks them? I do it to get better temps, prolonge component life and be in control of the thermal and noise aspects. Not to get a score on synthetic benchmarks.